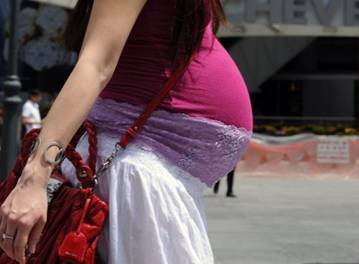 Women rarely have strokes during pregnancy or shortly after giving birth, but researchers have seen a big jump in such events over the past 12 years, according to a U.S. study published the 27th of July. A total of 4,085 pregnancy-related stroke hospitalizations were documented in the United States in 1994-95, and that number rose 54 percent to 6,293 in 2006-07, said the study in Stroke: Journal of the American Heart Association. Of course medical officials and doctors have not the slightest idea of what might be the most basic cause of this alarming rise. They speculate that more women are overweight when they become pregnant, which can add to the likelihood of complications from diabetes and high blood pressure. “Now, more and more women entering pregnancy already have some type of risk factor for stroke, such as obesity, chronic hypertension, diabetes or congenital heart disease,” reported Dr. Elena Kuklina, the study’s author. The question remains, what is the underlying condition or conditions that lead to chronic hypertension, diabetes or congenital heart disease? What good is the medical press when they publish an article like this without going further to address the underlying causes of these strokes pregnant woman are suffering from? This recently published information about strokes fails to mention, for example, the detriment of drinking diet soda and the increased risk of stroke that comes from drinking products from Coca Cola, Pepsi Cola and many other companies. Researchers found that people who said they drank diet soda every day had a 48 percent higher risk of stroke or heart attack than people who drank no soda of any kind. The beverage findings should be “a wakeup call to pay attention to diet sodas,” said Dr. Steven Greenberg. He is a Harvard Medical School neurologist and vice chairman of the International Stroke Conference in California, where the research was presented on Wednesday. A simple solution, health experts say, is to drink water instead. Aspartame, a toxic chemical, is found in over 6,000 diet products and is being consumed by an estimated two-thirds of the population. The National Institute of Health tells us that magnesium deficiency can cause metabolic changes that may contribute to heart attacks and strokes. Dr. Tavia Mathers and Dr. Renea Beckstrand from Brigham Young University published in the Journal of the American Academy of Nurse Practitioners in 2009 that magnesium has been heralded as an ingredient to watch in 2010 and noted that magnesium is helpful for reduction of the risk of stroke. Dr. Saver and colleagues investigated the neuroprotective effect of early magnesium infusion in ischemic or hemorrhagic stroke in the field; three quarters of the infarct cohort were treated with magnesium within two hours of onset, and nearly one-third within one hour of onset. Dramatic early and good results were reported in the early (42% of <2-hour infarct patients) and 90-day global functional outcomes (69% of all patients and 75% of <2-hour infarct patients), respectively. According to the current European treatment guidelines, no neuroprotective treatment is recommended for stroke patients. The results of a 10-year study published in the August 28, 2008 issue of the New England Journal of Medicine found that magnesium administered to women delivering before 32 weeks of gestation reduced the risk of cerebral palsy by 50 percent. The Beneficial Effects of Antenatal Magnesium (BEAM) trial was conducted in 18 centers in the U.S., including Northwestern Memorial, and is the first prenatal intervention ever found to reduce the instance of cerebral palsy related to premature birth. Magnesium sulfate and magnesium chloride are used in obstetrics to stop premature labor and prevent seizures in women with hypertension. Magnesium is used intravenously to prevent hypertensive crises or seizures associated with toxemia of pregnancy. Magnesium is needed for reproductive fertility, and the use of pharmaceutical contraceptives is known to diminish magnesium stores in our body. The rate of premature births has increased more than 30 percent since 1981, but a central obvious cause is ignored by doctors. Magnesium plays a crucial role in fertility, pregnancy,,, and in early newborn life and many of the problems associated with pregnancy and birth can be resolved by magnesium supplementation. In 1991 Dr. Jean Durlach said, “Primary magnesium deficiency may occur in fertile women. Gestational magnesium deficiency is able to induce maternal, fetal, and pediatric consequences that might last throughout life. Experimental studies of gestational Mg deficiency show that Mg deficiency during pregnancy may have marked effects on the processes of parturition and of postuterine involution. It may interfere with fetal growth and development from teratogenic effects to morbidity: i.e. hematological effects and disturbances in temperature regulation. Clinical studies on the consequences of maternal primary Mg deficiency in women have been insufficiently investigated.” Magnesium is frequently used as the treatment for stopping premature labor and the seizures of eclampsia at the point it starts, but might be more helpful in preventing these if supplemented throughout the course of pregnancy. It really is a crying shame that contemporary medicine cannot put its shoes on and tie the laces when it comes to magnesium medicine. When it comes to helping pregnant mothers weather the stress of pregnancy, and navigating around the potential risks of strokes, seizures and many other complications associated with pregnancy and birth, there is nothing like magnesium. Doctors who practice pharmaceutical-driven medicine are like builders who forget to build the foundation. They prescribe medicines that further strip the body’s cells of their magnesium stores without paying any attention to the deficiencies that are there. That’s medical negligence and malpractice all rolled into one. Toni D, Chamorro A, Kaste M, Keddedy Lees, Wahlgren NG, Hacke W, for the EUSI Executive Committee and the EUSI Writing Committee. Acute Treatment of Ischemic Stroke. Cerebrovasc Dis. 2004;17(suppl 2):30-46. Semczuk M, Semczuk-Sikora A. New data on toxic metal intoxication (Cd, Pb, and Hg in particular) and Mg status during pregnancy. Med Sci Monit. 2001 Mar-Apr;7(2):332-40. Folic acid, vitamins E, B6 and B12, iron, magnesium, zinc and selenium deficiencies have been known to cause infertility that is easily reversible with supplementation (McLeod, 1996). Women are another group of drug consumers who should be especially concerned with drug-induced nutrient depletion. Few women know that oral contraceptives lower the levels of such vital nutrients as Vitamin B2, B6, and B12, Vitamin C, folic acid, magnesium and zinc. Mainstream hormone replacement (chiefly Premarin, but also Estratab and raloxifene) can also lead to deficiencies in Vitamin B6, magnesium and zinc. Drugs That Deplete – Nutrients That Heal, a review of the book Drug Induced Nutrient Depletion Handbook by Pelton et al. Rats kept severely magnesium depleted (receiving 1/200 the control magnesium intake) for the entire 21-day period of gestation had no living fetuses at term (Hurley and Cosens, 1970, 1971; Hurley, 1971; Hurley et al., 1976). The shorter the duration of the magnesium deficiency, the fewer implantation sites were affected. When the deficiency was maintained from day 6-12, about 30% of the implantation sites were involved and 14% of the full-term fetuses had gross congenital abnormalities (cleft lip, hydrocephalus, micrognathia or agnathia, clubbed feet, adactyly, syndactyly, or polydactyly, diaphragmatic hernia, and heart, lung, and urogenital anomalies). Milder magnesium deficiency (1/130 control intake) maintained throughout pregnancy resulted in resorption of half the implantation sites and malformation of the living young at term. MAGNESIUM DEFICIENCY IN THE PATHOGENESIS OF DISEASE, Seelig, M; Part 1, chpt. 2. Infants at greatest risk of neonatal hypomagnesemia are low-birth-weight infants, including those suffering from intrauterine growth retardation (IUGR) or premature infants recovering from birth hypoxia or later respiratory distress, and infants born to very young primiparous women or to young mothers who have had frequent pregnancies or multiple births, to preeclamptic mothers, and to diabetic mothers. The incidence of neonatal magnesium insufficiency may be greater than suspected. The tendency of women with preeclampsia or eclampsia to develop rising plasma magnesium levels during the last month of pregnancy, even without magnesium therapy, despite which they retain high percentages of parenterally administered pharmacologic doses of magnesium, suggests that magnesium deficiency might be far more common during pregnancy than is indicated by the incidence of hypomagnesemia. MAGNESIUM DEFICIENCY IN THE PATHOGENESIS OF DISEASE, Seelig, M; Part 1, chpt. 2. Sudden infant death syndrome (SIDS) is defined as the sudden death of an infant or young child, which is unexpected by history, and in which a thorough postmortem fails to demonstrate an adequate cause for death. SIDS accounts for 35% of post-natal deaths.